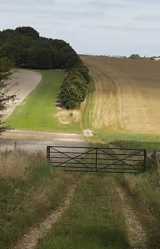 Similar to the Great Cursus near Stonehenge, a pair of parallel banks and ditches, spaced roughly 100 metres apart, run for a distance of roughly six miles (9.6 km). Its course is mostly straight and seems to take little account of hill or dale. Unlike the Stonehenge example very little is visible from the ground and the feature can only truly be appreciated from the air. The most obvious remains of the cursus are the terminal bank-barrows at the southern end and the long barrow approximately half way along its length. Nearby the remains of a small settlement have also been discovered. The extensive Bronze Age barrow cemetery at Oakley Down also lies close to the western edge of the cursus, roughly half way along its length. Many more barrows were located close to the cursus which have since been "ploughed out" by modern agricultural activity. At the northern end there is evidence to suggest that a second cursus may once have existed, running at a near right angle to the east along an alignment marked out by two nearby barrows. The purpose of the Dorset Cursus, (and, indeed the Greater and Lesser Cursus at Stonehenge) is unknown although it is widely suspected that it may have been associated with funeral games or races. It is possible that the function of the cursus has some association with the nearby Knowlton Henge complex and the recently discovered henge at Wyke Down. Whatever the purpose of this site it clearly took some dedication and coordination to build. Over six million cubic feet (170,000 cubic metres) of chalk were removed in its construction. Research has suggested an alignment on certain stars. In John North's book, "Stonehenge, Neolithic Man and the Cosmos" there is a fascinating theory concerning the observation of two stars from the Great Cursus at Stonehenge and the processions which would have been possible in the time between the setting of one and the rising of the other. His research has shown that similar observations would have been possible from the Dorset Cursus. Low down are secrets found. "Who comes to wake our weary bones?"